A little craft for the travel freaks here. This passport cover is easy to make and is absolutely fun to make. It didnt took me more than 15 minutes to complete this project. I love projects that are completed in short time and in one sitting. This one absolutely one of those projects: fun to do, exciting, useful and quick. 1. Faux leather. I used textured Creme and dark brown for the name tag. 3. Any Charm. I used star, an aeroplane charm would have looked better but I couldn't find one. 1. 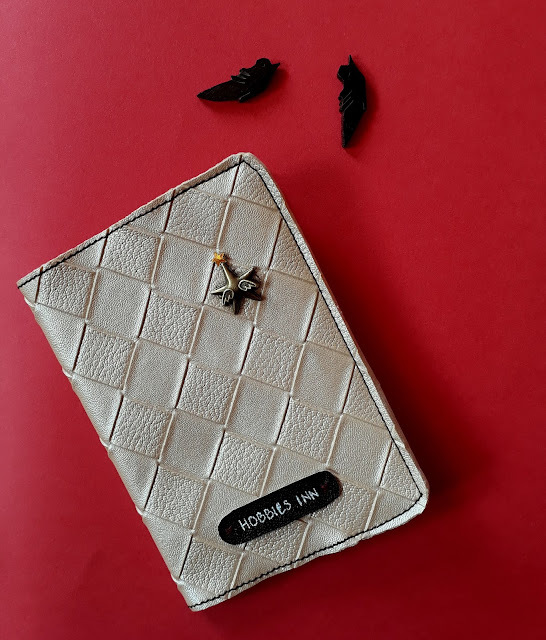 Cut out the leather of the size of the passport when opened plus 0.5 cm. i.e. 0.5 cm's extra of what the size of the passport is. 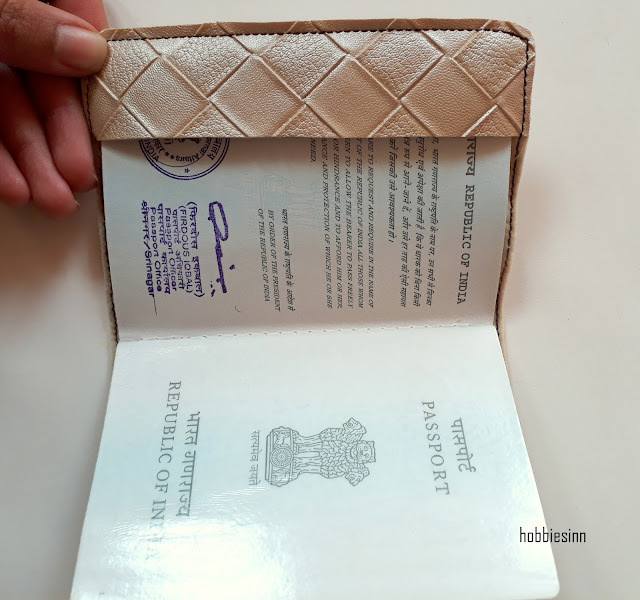 this is mandatory because we will stitch on the margin of the size of the passport and leave the extra fabric. we will cut two stripes of same size, height equal to the height of your fabric and width equal to 1 to 1.5 inches. 2. Put the two fabric pieces on the each end of the main body fabric. 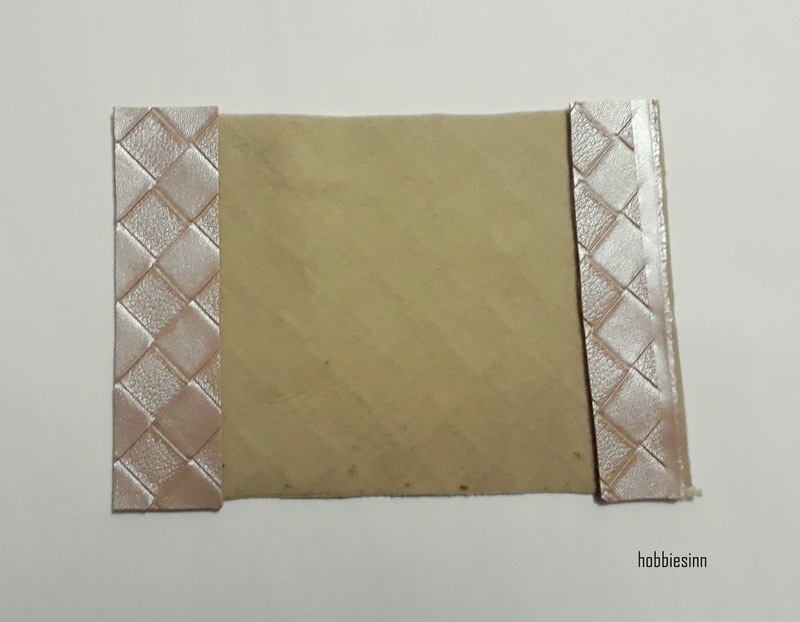 Hold with pearl headed pins and start to sew using sewing machine. 3. Cut out the extra fabric from the sides and make the corners round. Put in the passport and see if it fits well. 4. Your cover must not fold your passport and neither should it come off easily. Make sure to mark it appropriately to make it a perfect fit. 5. 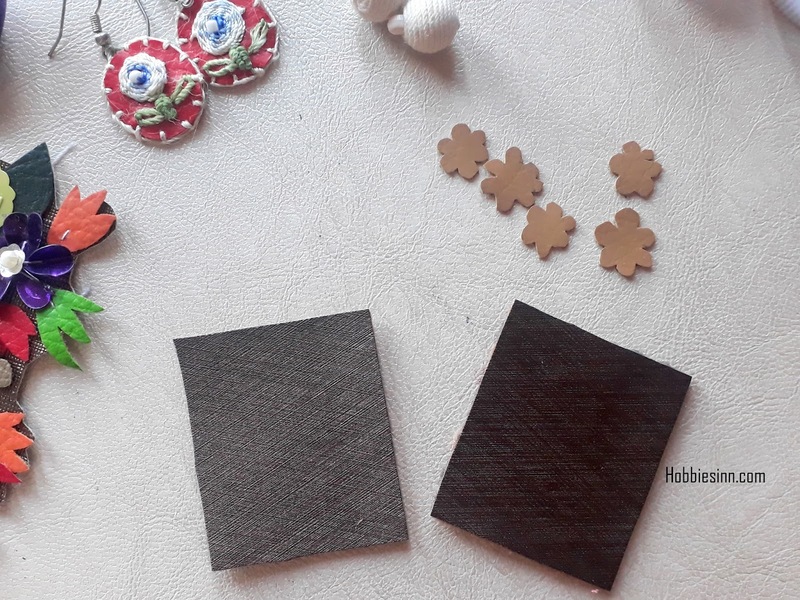 Cut our a round cornered rectangle out of dark brown leather less than 1cm of height. With the help of permanent pen write down your name. 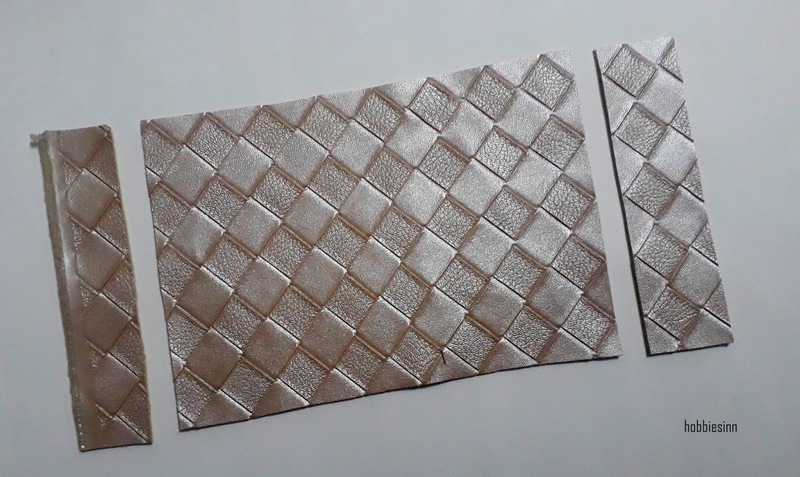 That is easy, If you have enough time and resources, you can opt for embossing on leather. I fixed it to the cover by stitching on the two ends. You can also use the studs as well. 6. 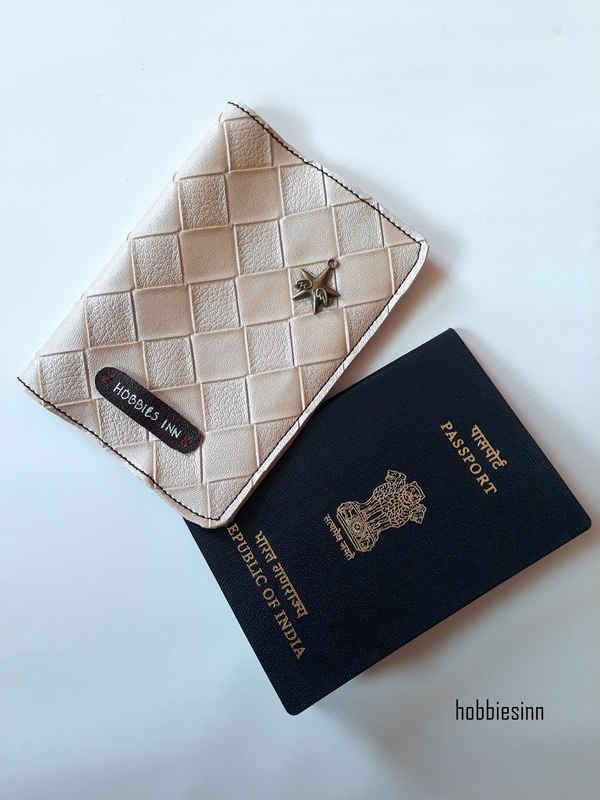 I have an Indian Passport and the cover fits it well and looks absolutely cool. You can also make similar covers for your other diaries, booklets and other small cute books that you have. 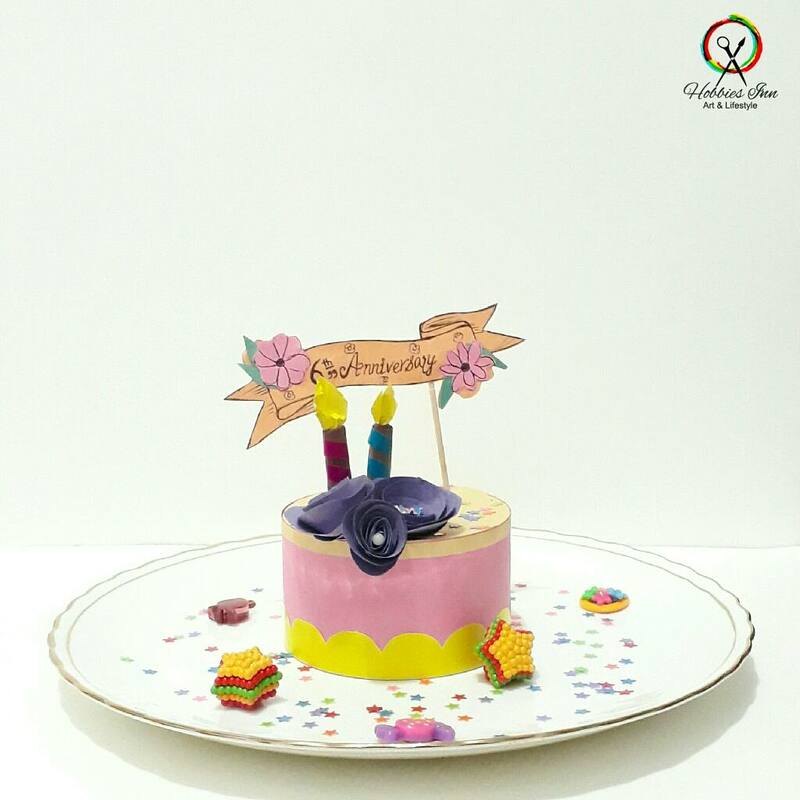 Tag us in your posts and share your creations with us. Yay another faux leather tutorial. I have been working on leather projects for quite some time now and i intend to add as many different DIYs as possible. Today's post is a jewellery project. 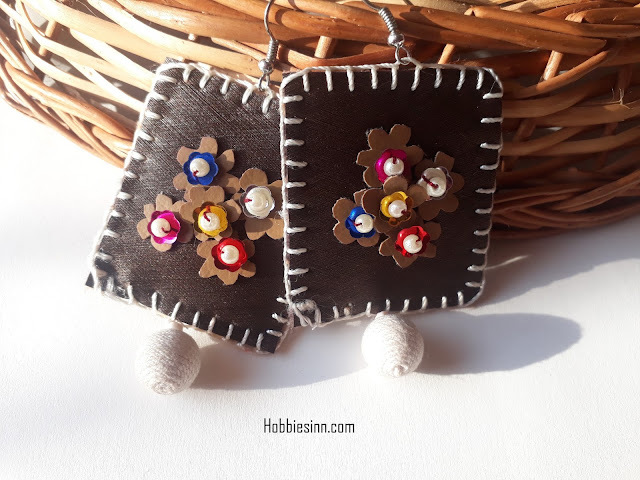 A fun and Boho styled Faux leather earrings. I will add more jewellery projects in coming days. And also some General information about the faux leather, its types, uses, and other such stuff. If you want to try out some other cool and easy leather DIYs check out my apron tutorial and this tassel tutorial. and I'm super excited as I have compiled it to basically show you guys how I embroider using leather and sequins. you too can use them to create beautiful designs that are easy and quick. I hope you enjoyed my blogging journey that I posted couple of days ago. If you have missed it you can check it out here. Okay, so on to our jewellery project. I used 2 shades: bronze for background and camel color for the flowers. 4. Tapestry needle and thread. 5. Silk or embroidery thread. 6. Little beads to hand at the bottom. 1. Cut out two stripes of equal length and width. This is entirely your choice as to how big or small you want your earring to be. My earring stripes were almost 3.8 inches long and I divided it into half for front and back of the earring. The width of the each strip is 1.5 inches. 2. Take the camel color leather and cut out 10 small flowers from it. 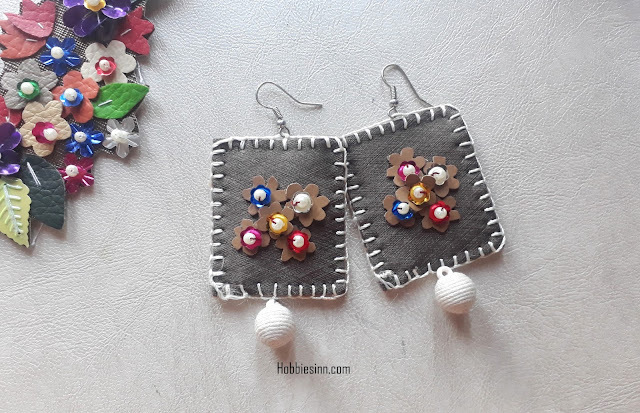 5 for each of the two earrings. 3. 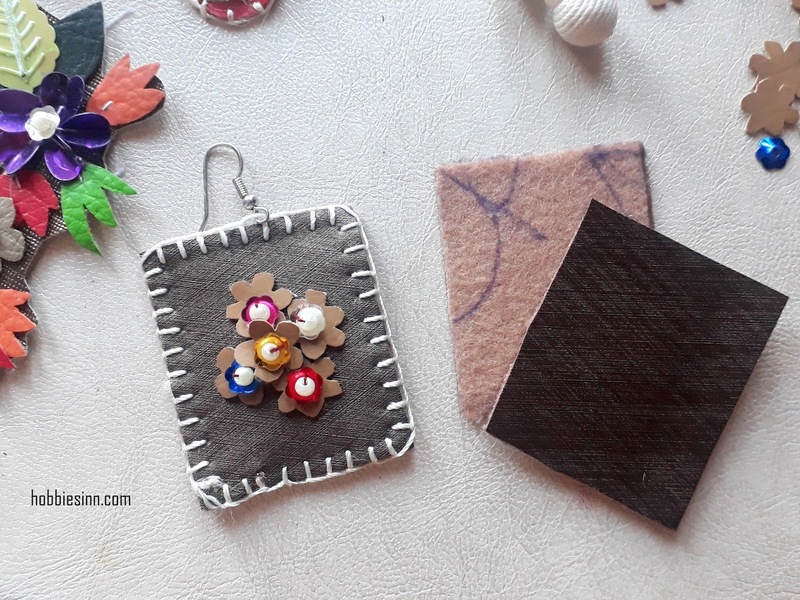 Take one little piece of leather and begin stitching the flowers to it with the help of tapestry needle and thread. I added little sequins and pearl beads to make flowers more lively and colorful. 4. Take the white embroidery thread, place the two pieces of leather together and stitch around the border. 5. At one end, fix the earring hook and at other a little dangling bead. I have compiled a little video on this Earring. Watch me making it. I would look up for stuff on Google and immediately fell in love with the idea of blogging. I perceived it as a learning and teaching process. When I saw people around the world showing their crafts, I was motivated to do something like that too. I knew about blogs and stuff and came across the free blogger platform-Blogger by Google. 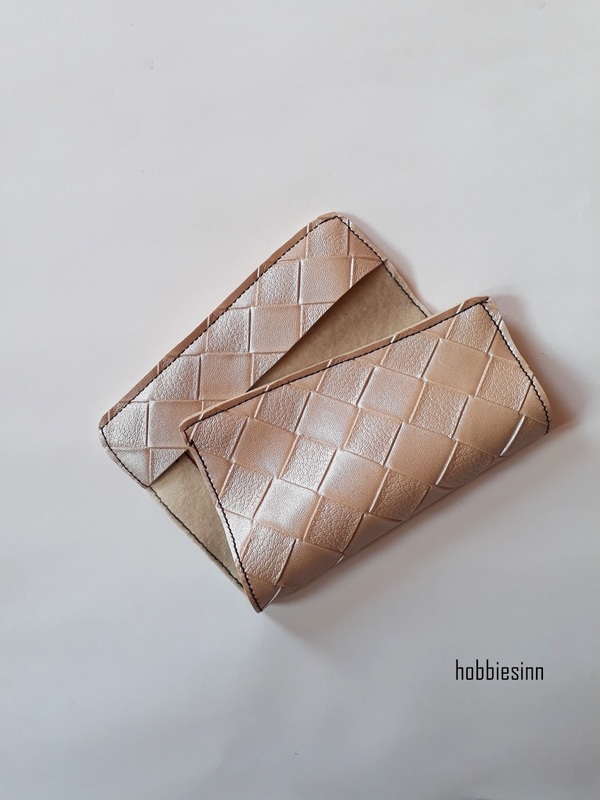 After thinking a lot, I named my blog as Hobbies Inn – A little Inn for Hobby enthusiasts. And it still has the same name. Though I changed the domain from Hobbiesinn.blogspot.com to HobbiesInn.com. To be honest I had no blog plan or I didn’t know about SEO and other things too. I would post occasionally about the crafts that I did. I was not aware how blogs work (Which I am now). But no matter what, as much as I enjoyed doing my crafts, I equally enjoyed posting about them. Since I was a college student, my studies demanded much more from me. I was a top student and worked very hard on my subjects and hence I was not able to post that often. 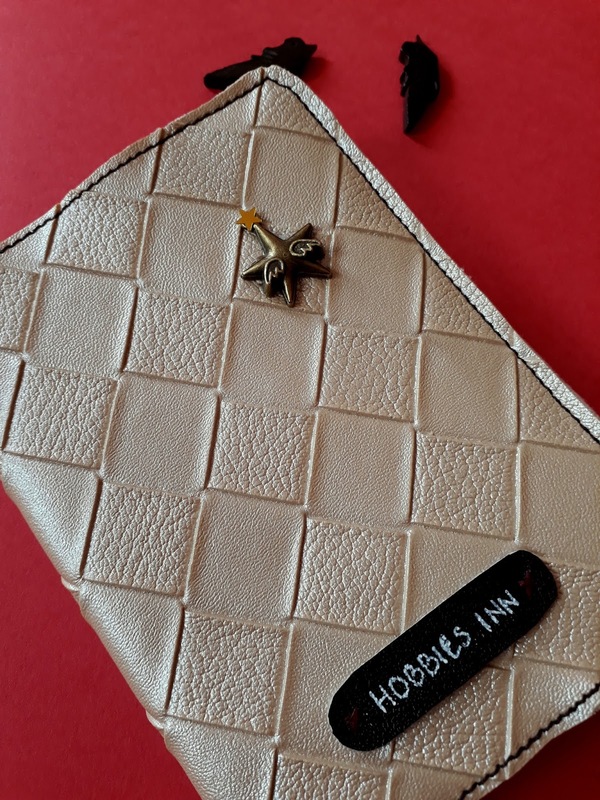 But Hobbies Inn survived, because, I am a very passionate crafter and arts and crafts is my first love and the blog stats was always positive and great. I had a major dip in blogging In 2014, I posted only 7 posts, well we were drowned in devastating 2014 floods with hardly anything to eat. You cannot imagine a girl to craft in that situation and post about it! Also, we had no communication of any sort for almost 1.5 months as well! Moreover, my college projects and internship demanded so much from me. Tough time that was! We hadn’t seen such devastating floods in about 100 years. Whole city was submerged in water for more than 1 month. Read more about 2014 Kashmir Floodshere. My blogging again saw a dip in 2016, for nearly 6 months, we had no internet or phone communication in whole state. We are habitual to frequent Internet/communication gags and that one was the lengthiest one I suppose. It was not the internet alone, we too were gaged inside our homes from June till November! That year I completed my college, had a bad case of chicken pox along with my sister, read almost 20 books in a month, tried my own weird hair styles, exercised a lot, procrastinated a lot too, had no idea about where my friends were, never wore anything else other than my pajamas, didn’t use phone (gaged), didn’t watch TV (It was gaged too), would listen to anything on radio though and that included vividh Bhariti… wow. And yes crafted a lot with everything that I had(I didn’t photograph them or write about them, I couldn’t have even if I had wanted to. I just enjoyed doing them). When my supplies were over, I turned to gardening and that included pretty much watering the plants and de-weeding. Never the less, we were depressed to the core. We were scared and sad, people were being blinded and killed. Many of us suffered psychological problems and the sufferings seemed unending. Read more about 2016 Kashmircrises here. By the time all was over, I had lost motivation for everything, I had stayed too much Inside my home doing everything that I wanted to or didn’t want to that next few months of 2017 were spent in doing things that were none of them! It was very hard to again start studying and working on career goals. However, I managed to work on my blog a little. I created social media handles on Instagram and Facebook and also started a YouTube channel. I had a Facebook handle for my blog back in 2014 but I deleted it because it was getting burdensome at that time of my life. However, now I have a plan and a greater ambition for this little blog. I am posting more often and with more details. I am more focused and have certain goals to achieve. I have learned a lot not only in various crafts that I do but also in the profession of blogging. At this point, I am quiet motivated and have a plan. Through all this thick and thin, my sister was my partner in crime, co-conspirator and full support system. 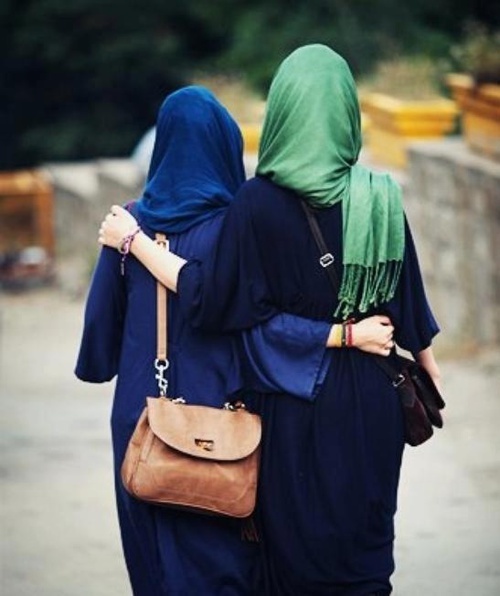 When I say “I” it automatically includes my sister by my side. She critiques my projects and crafts and I make her proof read all that I write on this blog. Many of the projects here are outcome of both of our creative minds. She helps me in photographing the projects and reminds me of my unfinished ones as well. Crafting alone is good but crafting together is great. Now, the situation in Kashmir valley is different, more people are coming towards crafting and handmade business but Hobbies Inn stands as the only craft blog whose purpose is to learn and teach rather than sell. Our goal is to promote healthy habits and help people come towards creativity from their sedentary lifestyle. We try to expose people of Kashmir to more and more crafting and how can they achieve all that in terms of technique and where to get the supplies as well. We try to change the meaning of “Internet” from “Social Media” to what it actually is. Kashmir is a beautiful place with beautifully talented people, our motive is to motivate them, kill the depression and anxiety and help them lead a creative and healthy lifestyle especially among women. 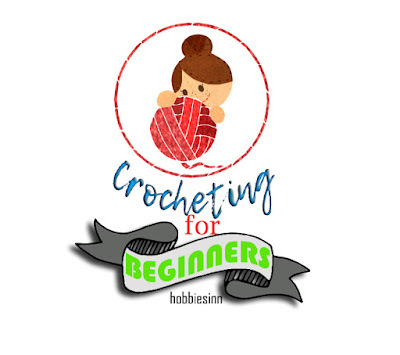 We post mainly about Crochet, Sewing, lifestyle, foods and other random crafts. We have also introduced our own stylized leather crafts and we hope to add more to these categories. 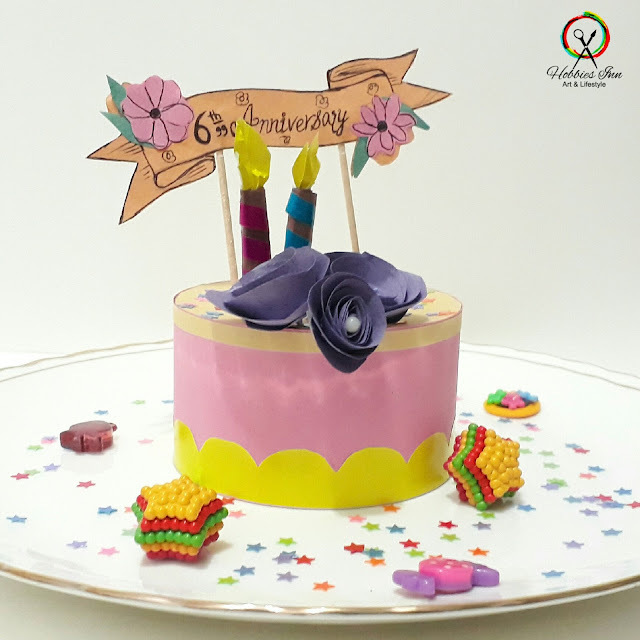 This is our Journey so far, hope you enjoyed reading it and hope to add many more great years to it. Keep reading, learning, loving and supporting. Your Support means a lot and keeps us going. Of course you can buy a sketchbook but at some point of any crafters and artists life, a handmade sketchbook is all that is “wanted”. The joy of creating ones own version of art supply is irresistible and of course using it gives even more joy. 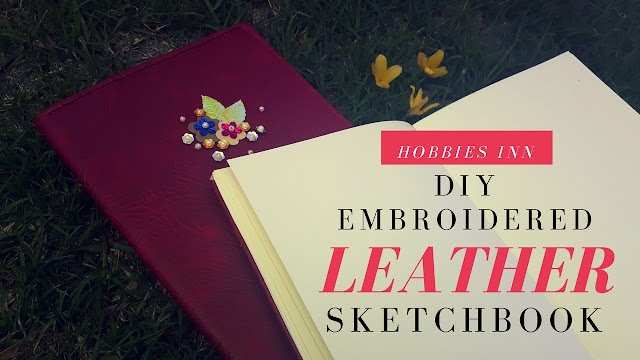 There are several ways of making a sketchbook or a diary, however in this tutorial we will see how to join pages using stapler and glue and then making a cover of faux leather to give it a beautiful look. The size of this sketchbook is A5 i.e. 8x6 inches. Before starting to fold the paper you need to choose your paper. The paper chosen must be of quality good enough to support your artwork. If you sketch often then a sketching paper will work good, if you are a watercolorist then I suggest you to use good weighted watercolor paper so on and so forth. Also, keep in mind that too thick paper will not fold easily so avoid going above 300gsm paper. For this particular sketchbook I have used a 120gsm drawing paper. If you cannot get separate loose sheets in the market or your local art store then purchase an A4 normal sketching pad and use its paper. Take 2 sheets together and fold them in the center. The more neat the fold the more perfect the sketchbook. Now open these pages and at the crease put them on the eraser on your table. Staple it where the eraser is underneath. Pull the eraser out of the stapler pin and manually close the pin. Do the same at the other end. I made total of 9 such sets of folded paper, i.e. I have used about 18 A4 sheets. My new sketchbook will have 36 pages. Each set well stapled and folded neatly. Now that we have 9 sets of inside paper we will join them together before proceeding to make the cover. On the crease (center) of 1 set apply glue. Put the other set over it and paste them together. Make sure the pages are lined properly and neatly. Do the same for each set. Hold them tightly with the help of a binder clips till it is dried. Check my video below and see how I did it. The paper to be used for the cover should be heavier than the pages used inside. You can use a paper of more the 300gsm of weight or simply use the cover of the sketchpad like I did. Fold it in the center. You can check my video below to see how I did it. Exactly the way a notebook cover is folded. Tip: I like to make my cover ½ – 1½ cm larger in width and height than the inside pages so it neatly covers everything inside. You can paste this cover with the help of glue to the inside pages here and decorate the cover as liked. This step completes the sketchbook unless you want to cover it with leather. I have not pasted the cover yet because I want to add leather to it. Cut out the faux leather fabric + 1 inch more than the cover on all sides. Cut the corners too. Use the sequins and some leather flowers and stitch them in a floral pattern on the front side of the cover. This step may take time but it is worth it. Here at this point you can also embroider your name or anything you may like to. Check out some small embroidery inspirations from Pinterest. 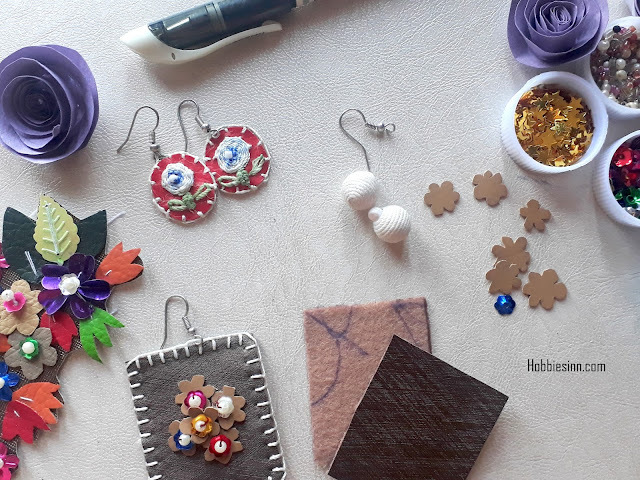 I used sequins and leather flowers because that did not require any special skill or material to do but just few of my crafty things put together. Hence, anyone can do it and it is not difficult at all. You can check my video to see how I did it. I have fast forwarded it a bit to make the video short and enjoyable. After you are done with the embroidery, join the leather with the cover. 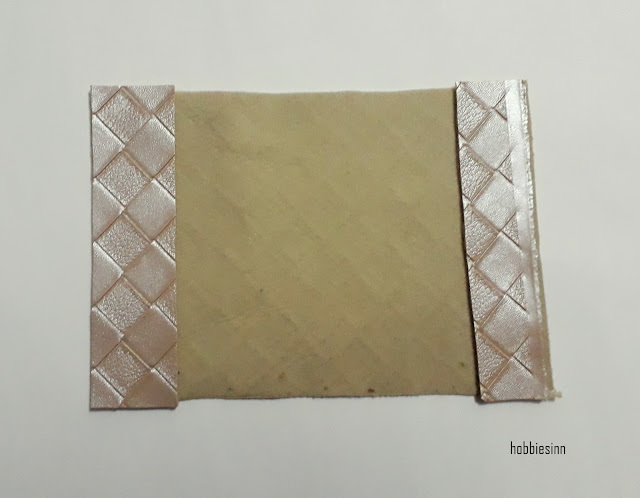 Apply the glue to one side of the cover paper and paste it to the leather. Let it sit till it dries. Now either use a sewing machine or use a tapestry needle and thread sew the edges of the cover. It holds the leather in place, makes it durable and gives it a pretty look. Take a spare drawing sheet and paste it to the inside of the cover to hide all the thread. Take the binder clips out of the inside pages, you will see they are completely dried and opens like magic. Put these pages at the center of the cover and fix with the help of the glue. Hold tightly using binder clips again and let it dry for at least a day. After this you will have your sketchbook complete and ready to use. This project does take time but all the work and time invested is worth it all. In the end you will have one of a kind diary/sketchbook that only you own in the whole world. You can take pride in using your own beautiful book for your beautiful thoughts/sketches. The perfect pretty sketchbook for perfect pretty drawings and perfect pretty you. I love the fact that I did this little love from the very scratch. Make your versions of this sketchbook and tag us in your creation on Instagram. Watch the video tutorial below to understand it more effectively. Don’t forget to pin it, subscribe to our channel and follow our blog. See you till next time. Bye. I am from a place where you will get yarns of varying sizes but no one actually knows what to call what. In a typical Kashmiri yarn store (that are quiet few and not everyone knows about them) almost no yarn is with a clear label that states what its weight is. The yarns come in great quality and pretty colors but pose a difficulty in understanding its weight and hence in yarn projects. 1. Reading and understanding patterns. 2. When using scrap yarn for scrap yarn projects to use yarns of equal weights. 3. When using a substitute yarn. These standard yarn weight measurements are used and understood universally and used in both UK and US terminology. How to determine the weight of a Yarn? The WPI (Wraps Per Inch) method. 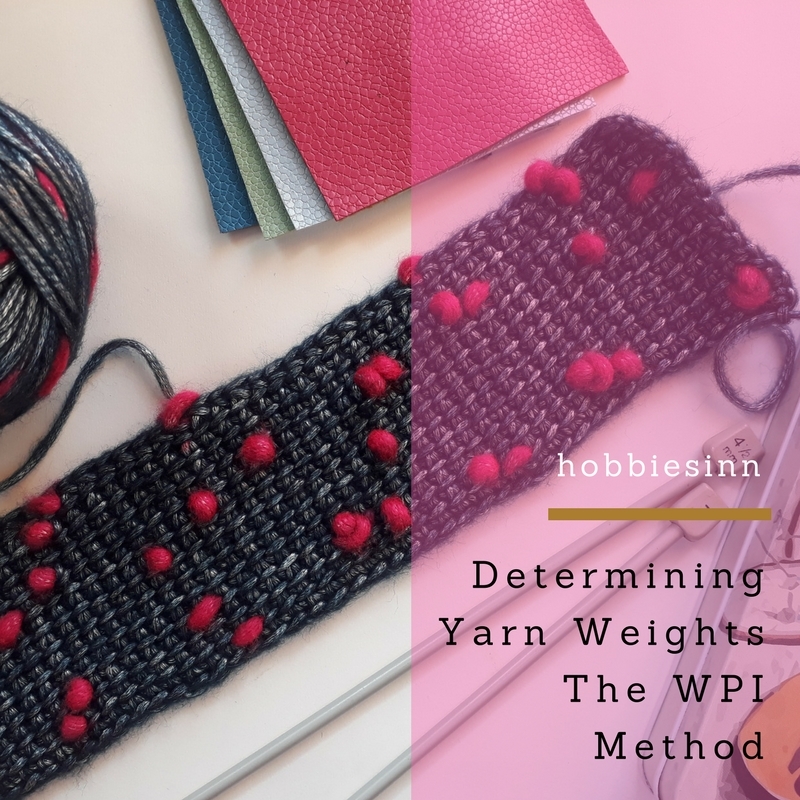 In case you don't know how to determine the weight of a yarn that has no label on it, like I used to get pretty confused when buying any yarn, then follow this easy and simple method and classify your yarn stash. 4. An object with consistent circumference, such as a Popsicle stick or a pencil. Hold one end of your yarn with the help of binder clip with the object of your choice. Now begin wrapping it around it. Count the number of times you wrapped the yarn around the object for the measurement of 1 Inch. That number will tell you what type of yarn you have. Remember not to wrap the yarn too tightly, the goal is to get the accurate measurement of the yarn and not distort it by pulling too hard. Also, if you are using a yarn with inconsistency, like eyelash yarn then wrap for a bit more than 1 inch to get the accurate result. 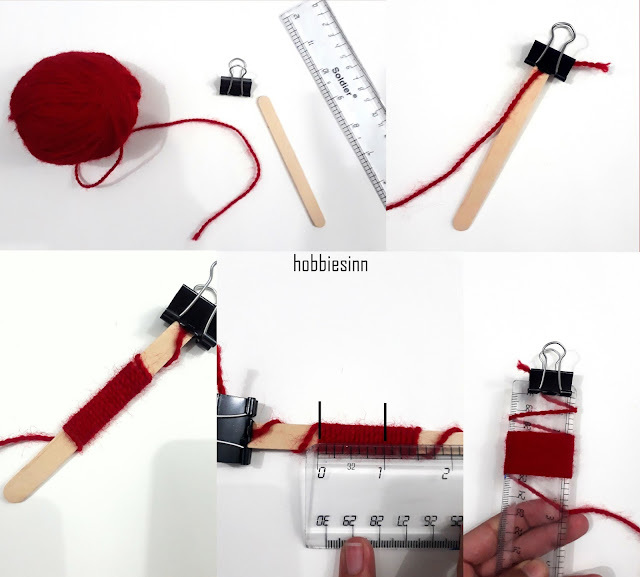 You can also directly use your ruler to wrap the yarn for the measurement. How WPI(Wraps per Inch) works? The yarn measurement is determined by the diameter of its strand. The circumference of the object doesnt matter because we are working in the diameter of the yarn strand and not on its length and hence that doesnt matter. It makes no difference to the width of yarn strand whether it is wrapped around a popsicle stick, a pencil or a bottle, the measurement will remain the same. Makes up to 9 stitches per inch. Makes up to 7 or 8 stitches per inch. Makes up to 6 or 6.5 stitches per inch. Makes up to 5.5 or 6 stitches per inch. Makes up to 4 or 5 stitches per inch. Makes up to 3 or 3.75 stitches per inch. Makes up to 1.5 or 3 stitches per inch. I hope this piece of write up was helpful and will come handy in future. So, pin it and share it. 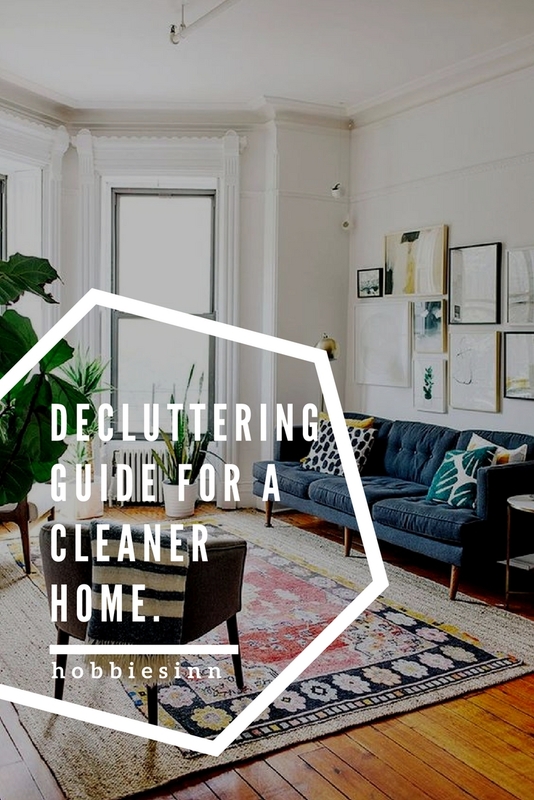 Decluttering Guide For a Cleaner Home. Talk about Hoarding, Kashmiri's are masters in it! Talk about Decluttering, it is a blasphemy! We Kashmiris hoard about everything and anything. We love to stock things that we need not. The list can go on and on, utensils, clothes, furnishing are just few examples. I am on a Decluttering drive and it is driving me nuts and also recently I saw two of our next door neighbors roughly constructing garden sheds and cupboards under their ground floor verandahs ( in addition to the warehouses ) just to accommodate the junk that was littered all over the place! We need serious organizing here! Seriously! Therefore I compiled this guide to help anyone who is trying to make their homes a bit cleaner. The clutter is anything you’re keeping around you in your house that firstly doesn’t add value to your life, secondly, doesn’t benefit you ever! Decluttering means making room for yourself and things that matter in your home. However you may define clutter, it is bad for your health. 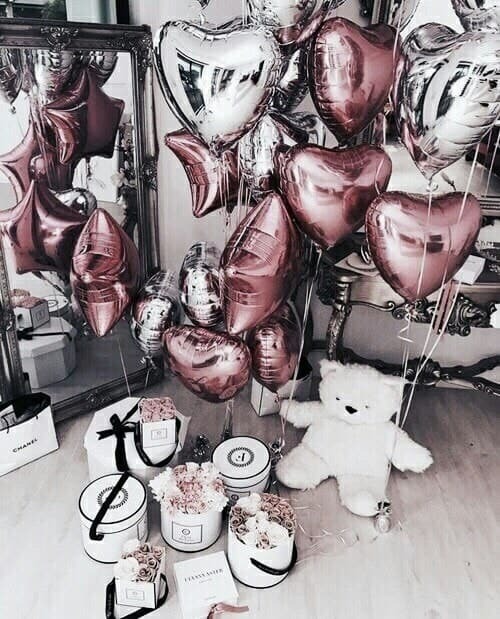 According to Psychology Today, people tend to feel like life is out of control when they surround themselves with more things than they can manage. The mess causes stress. If you’re not taking care of the clutter in your home, you may not be taking care of yourself either. Because it relieves stress and provides some sense of control and accomplishment. Cleaning the junk and freeing that corner of your house gives you extra space and satisfaction. It is enjoyable and your home feels more like your home! Whatever the reason, I have compiled some tips to help you declutter your highly hoarded Kashmiri house. Don’t discuss that with your Kashmiri mama, you will be thrown out before anything else! Step 1: Set Goals, Make a Plan. Before throwing everything out or sitting in a mess from every corner of your home, make a plan. No matter how much you have to get through, set goals and try to accomplish them one by one. This will reduce the frustration and confusion while you are at work. Make the list of all target areas (rooms, cupboards and under the bed’s in some cases). Consider the severity of the clutter they have. Some places are loosely cluttered and are not stuffed with excessive mess, these are easy to handle. This will help you manage your time effectively. You should understand that this is a work of few days and not one day so set completion times and dates for the clutter areas. Step 2: Sort the things out. The things that are no longer needed by you must belong to any one of the above. There are things that are entirely rubbish and will provide no value to anyone and hence must be thrashed. However, some of the things can be donated to the needy. One man’s clutter may be another’s need, so, decide wisely. Maybe those extra sheets or clothes, or those extra pieces of carpets, bedding's or utensils will fill up need of someone poor. Try to give out things that are in good condition. And yes, that plastic and paper is better recycled than consuming space in your home. Doing this, you are helping the planet earth a bit too. Lastly, if you happen to have some items that could be sold like furnishing, decoration, electronics etc. that you no longer need, you can sell them at some second hand market place and make some extra money too. Everyone has some junk lying around, there can be no denying. And there is certainly some junk that we adore and simply can’t throw away no matter how old and useless they turn. Talking about myself I too hoard so many things that I seriously don’t want to part away with simply because I love them or have spent a lot of money on. 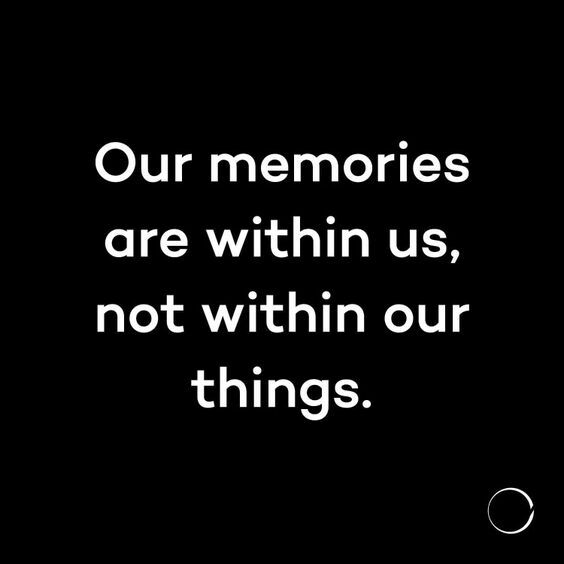 They are not junk, they are memories! 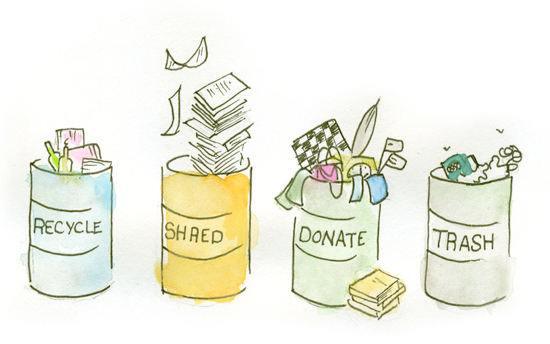 This is the hardest part of decluttering, deciding what needs to go and what needs to stay. These are real and valid feelings that make it challenging to part with our stuff. One must be mentally prepared to part with the things that one hasn’t used in a long time. When it comes to clothing, we generally only wear 20 percent of the clothes we own 80 percent of the time. This rule hold true for other things as well like books, kitchen stuff and other house accessories. Our mission must be to get rid of things that we don’t use 80 percent of the time. 3. Get over the costs. Ya Ya, you have spent hundreds over it and simply cannot throw that away. But that costs have been already incurred and cannot be recovered back so what is the point? These things should be considered as the sunk costs except in some cases where the value of the thing may have increased. 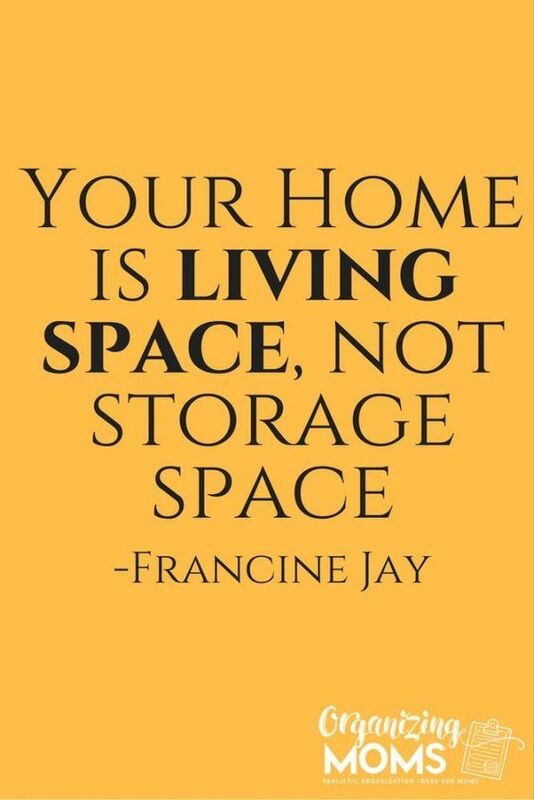 You will not get the money back you spent on that thing, but you can get your little space back and a cleaner home. 4. When was the last time you used it. They say if you haven’t used it in like 6 months, you don’t need it. So, do you think that the things that you have accumulated over some 10 – 15 years? If you pulled the item out and said, “I’ve been wondering where this was!" you should probably get rid of it. 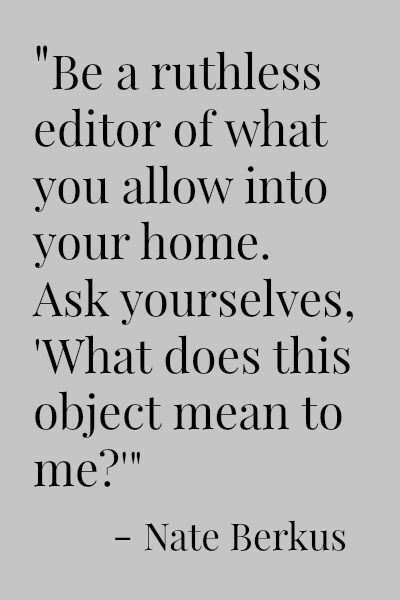 And if you didn’t even know you still had the item in question, you should definitely get rid of it –you didn’t miss it enough to warrant keeping it. After you have made the decision, stand strong on it. If something is not letting you sleep, you can still pull it out of junk the next morning but try not to do that otherwise you will end up amassing more than you had planned. I hope this was insightful and helpful. I will be posting more guidelines about how we can declutter bedrooms and study rooms effectively and how to find time for it.. Maybe a small post on organizing things too. Till than Bye. P.S. 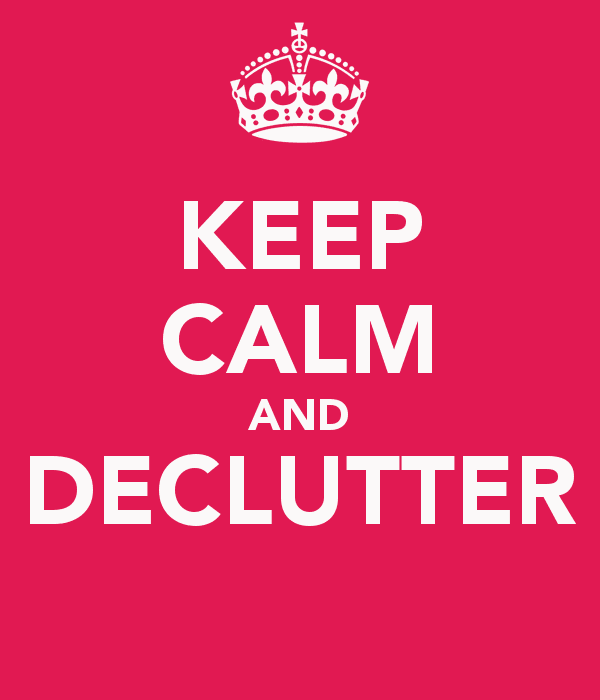 Comment what you think about decluttering and what do you do about it.